Let’s start with a brief intro of all the terminologies you need to know to get started with Ansible. Controller Machine: the main machine where Ansible is installed (same as the Puppet master), this machine will be performing all the provisioning on the remote servers you need to manage. Host: A host is simply a remote machine/node that Ansible controller manages. The Ansible controller gets to know about the hosts to manage via inventory file (briefed next). Inventory: is a file where all the hosts to be managed by Ansible controller are listed. 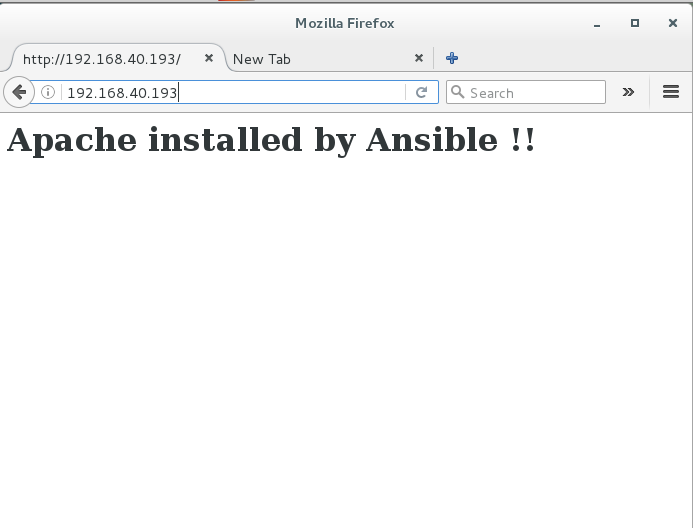 It’s an INI file, resides at Ansible controller – the default path is /etc/ansible/hosts. Task: is a unit of provisioning i.e. install a package; restart a service, etc. Play: Play is simply, a collection of (one or more) tasks for one or more hosts. For every play ‘host‘ (group of hosts) and ‘remote-user‘ must be specified. Playbook: Playbook composed of one or more plays, is a complete configuration file, which you may put on version control. Ansible configuration is defined in YAML format. Module: is what a task uses, it abstracts the real system commands and tools, for example ‘yum‘ module for package level tasks i.e. install, remove; ‘service‘ module for system service handling tasks i.e. restart, or stop, a system service. Ansible comes packed with a lot of built-in modules (almost for all the tasks), but for some custom task, you can write custom modules – can be implemented in any language, including Perl, Bash, or Ruby – but can leverage some useful communal library code if written in Python. List of all the modules. Facts: are the global variables Ansible uses to get dynamic system level info i.e. OS type, OS version, network interface info. Facts are used in Playbooks to keep the configuration dynamic i.e. installing Apache webserver depending on the OS type – apache2 for Ubuntu or httpd for CentOS. Handlers: Handlers are a special type of tasks (defined in a same way as tasks, at the end of the conf file), to handle required follow through actions for a task i.e. restarting httpd after conf update (the task). Handlers are called using ‘notify’ block inside tasks block. Templates – Templates are typically used to set up configuration files. The first step after we you have Ansible setup, is to add the hosts in the inventory file. The hosts can be listed individually or in groups. A host can be defined using it’s IP address or hostname, whichever is accessible – optionally also the port number in case the host is not accessible on the default SSH port. The inventory file is an INI file which resides at Ansible controller – default location is in /etc/ansible/hosts. This configuration file specifies five hosts. The first node is specified by its IP address and the latter four hosts are specified in two groups i.e. test-servers, and prod-servers. Playbook composed of one or more plays, is a complete configuration file, which you may put on version control. Ansible configuration is defined in YAML i.e. install-httpd.yml. Play is simply, a collection of (one or more) tasks for one or more hosts. For every play ‘hosts‘ (group of hosts) and ‘remote-user‘ must be specified. hosts – takes comma-separated host group names (as specified in the inventory) or individual hostnames. remote-user : For each play in a playbook, you need to specify which hosts in your infrastructure to target and what remote user to complete the steps (i.e. tasks). Remote users can also be defined per task. Note: The remote_user parameter was formerly called just user. It was renamed in Ansible 1.4 to make it more distinguishable from the user module (used to create users on remote systems). Handlers are simply the list of operations/tasks (not really any different from regular tasks) you need to run on change i.e. restarting Apache after conf update. Handlers are defined at the end using the ‘handler’ keyword (in same way as a task), and globally unique names. To call a handler action you need to use the ‘notify’ keyword at the end of a task and list the name of the handlers you need to trigger on the task’s success – in a play a handler will only be triggered once even if notified by multiple different tasks. 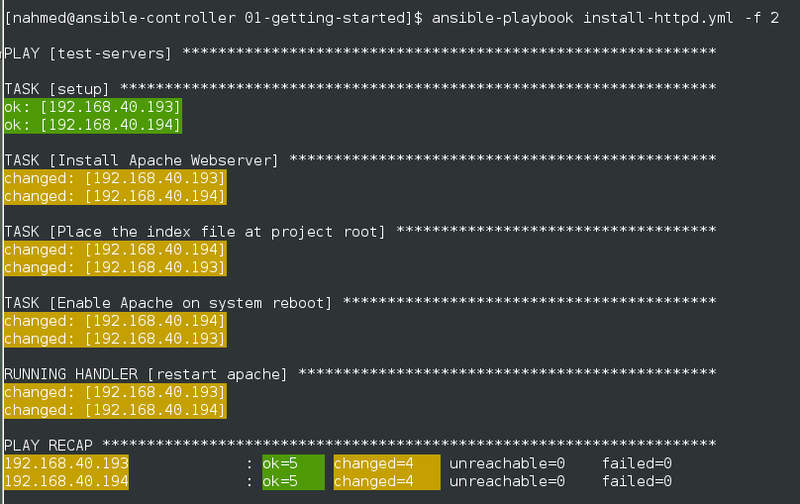 First you need to install Ansible, here’s a three nodes (one Ansible controller, and two remote hosts to be managed) step-by-step guide – Install Ansible on CentOS 7. The file is on github – install-httpd.yml.